Due to the weaker exchange rate and increased demand from overseas markets, Dutch food exports increased in 2015 and are expected to rise further in 2016. The Netherlands is one of the largest exporters of agricultural and food products in the world. Exports amounted to EUR 80.7 billion in 2014, and the sector accounted for 20% of total Dutch exports (18% in 2013). More than a quarter of food exports consist of re-exports, i.e. foodstuffs that are imported undergo minor processing and are exported again. Due to the weaker euro exchange rate and increased demand from overseas markets, Dutch food exports increased in 2015, and are expected to rise further in 2016. That said, the Russian import ban still affects the industry, particularly the fruit and vegetables subsector. In general, demand for Dutch food products is increasing, and profit margins of most businesses are expected to remain stable. Banks are generally willing to provide loans, and businesses´ indebtedness is rather low. The average payment duration is 40 days, and the amount of payment delays, protracted payments and insolvencies is low compared to other Dutch industries. In line with the overall trend in the Netherlands, food business insolvencies have decreased in 2015, and are expected to continue to fall in the coming months. Supermarket sales grew 1.7% in 2014, an increase almost similar to that of 2013. Again, the increase in revenue was primarily driven by higher volumes (up 1.6%) while prices increased only 0.1%. 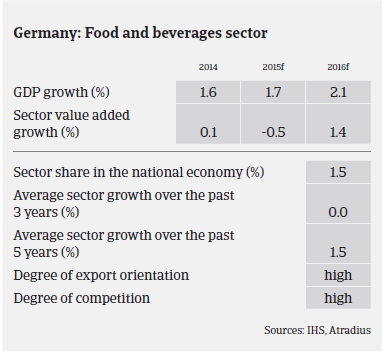 Turnover of other food, beverage and tobacco stores increased 1.5% in 2014, also driven by volume growth (up 1.3%) while prices were only 0.2% higher. Although the share of online food retail is still small (0.7% , i.e. EUR 320 million), this segment grew 13.5% in 2014 and is expected to grow further in 2015 and 2016. Competition in the Dutch food service wholesalers sector is fierce. As smaller hotels and caterers are increasingly buying directly from supermarkets because of price advantages, margins remain under pressure in this segment. That said, our general underwriting stance for the retail segment is relaxed. The dairy sector is an important segment of the Dutch food sector, with 65% of the milk production sold abroad, mainly to France, Belgium and Germany. The Netherlands accounts for 5% of global dairy trade. Since the drop in demand from Russia in August 2014, outside of the EU, China, Nigeria and Saudi Arabia are currently the most important export destinations. Cheese production decreased 2.7% in 2014 as a result of the Russian import ban. Despite an increase in the processed milk supply in 2014, the lower price levels for dairy products led to a 1.5% drop in the Dutch production value in 2014, to EUR 7.2 billion (down 1.5%). Increased production in several EU member states provided extra supply, which could not be absorbed as demand from China has decreased and the Russian import ban continues. However, since August 2015 the market has revived and prices have recovered. Dairy production is expected to increase 5% in 2015 thanks to the end of EU milk quotas in April 2015. Our general underwriting stance for the dairy subsector has become more restrictive in 2015 due to lower earnings, but the outlook remains moderately positive, as most businesses in the Dutch dairy processing industry are adequately financed and have a strong market position. That said, buyers who have planned higher investments and are mainly focused on the (currently shrinking) Chinese export market will be more closely monitored. The current trend of less energy consumption and lower gas prices is especially beneficial for the greenhouse vegetable segment, as lower energy costs help sustain margins. The Russian import ban continued to affect the sector in 2015, as total export volumes decreased 15% in H1 of 2015. Fruit growers faced an average 20% price decline in 2014 due to a very good crop harvest. They also suffered a considerable income decrease in 2014, and the permanent pressure has forced businesses in the fruit sector to look for alternative markets. The Russian food ban impacted apple exports in 2015, which decreased 14% in H1 of 2015. 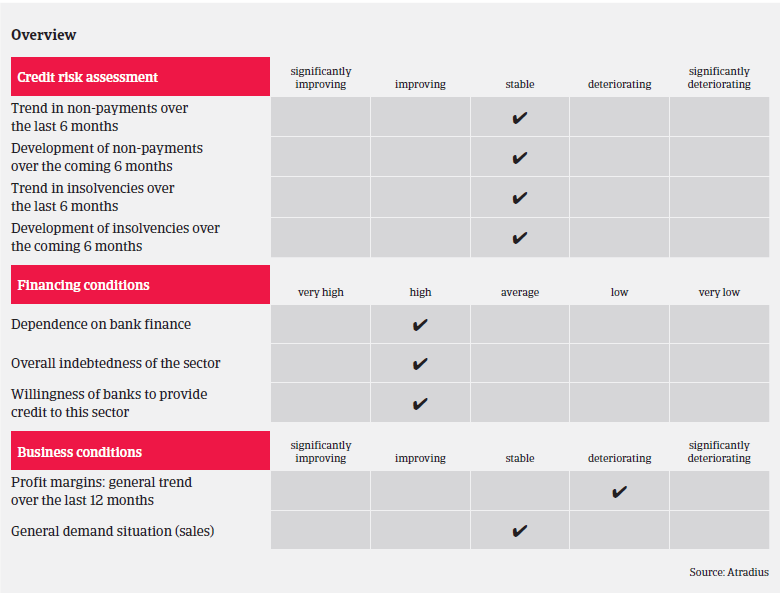 Our underwriting stance remains open, as our exposure is mainly focused on businesses at the end of the value chain. Those fruit and vegetable wholesalers mostly record low margins, but show high cost efficiency. 90% of Dutch pork meat production is exported to Europe, with Germany accounting for a 20% share. 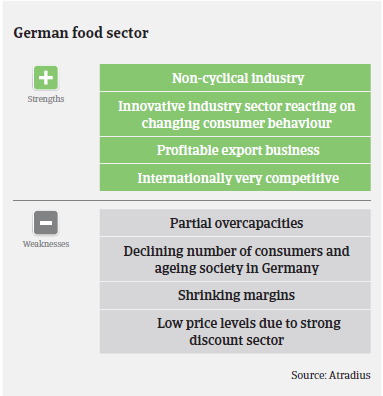 Pressure on margins is high and expected to remain so in the coming years, due to more quality-sensitive consumers, supermarkets´ bargaining power in price negotiations and overcapacities in the sector itself. We have observed that margins of those businesses with a focus on cost efficiency, innovations and good product quality have stabilised between 5% and 6%, while margins of companies which performed less well decreased to around 1.5%. In general, our underwriting stance for meat businesses remains neutral. In 2015, the Dutch ICT sector is expected to grow 3 % in volume, on the back of the country’s economic rebound (GDP is forecast to grow 1.7 %).